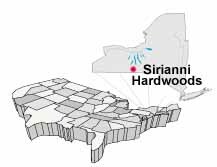 Sirianni Hardwoods, Inc. ...About Sirianni Hardwoods, Inc.
Sirianni Hardwoods, Inc. is located in Painted Post, New York, in the heart of the Northern Appalachian hardwood producing region. 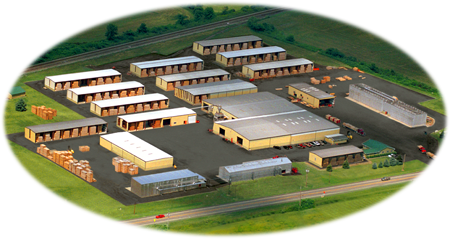 The company was founded in 1979 and is owned and operated by the Sirianni family. They have been in the hardwood business for four generations. Sirianni Hardwoods specializes in kiln dried Red Oak and White Oak lumber. They also dry a variety of other Northern Appalachian Hardwoods. The company supplies prime hardwood lumber to Manufacturers and Distribution Yards throughout North America and in the overseas market. When customers and suppliers visit Sirianni's concentration yard they are struck by the well-maintained facilities. The yards, kilns, warehouses and offices are kept in nearly perfect condition. Green lumber is stacked under Air Drying Sheds (6 million board foot capacity) and the kiln dried lumber is stored in three large warehouses (2 million board foot capacity). The dry kilns (900 MBF capacity) look like they were just built. Expansion of the yard and kilns and improvement to the production facilities is a continuous process. Sirianni Hardwoods plans to remain a leader in the hardwood industry in the years ahead. Our main expertise is the Yarding and Kiln Drying of lumber. We have always processed a lot of thick Oak and we know how to do it right. We prefer shed-drying to pre-drying. We feel the slower air drying process ensures better quality lumber. We also run mild schedules in our kilns to avoid stress in the lumber and to minimize degrade. These precautions are expensive, but we get excellent results. Sirianni Hardwoods produces kiln dried 4/4, 5/4, 6/4, 7/4 and 8/4 Red Oak and White Oak lumber. They also produce Northern Appalachian Ash, Cherry, Hard Maple and Soft Maple lumber. About 80% of production is FAS/1F. The balance is high grade #1 COMMON. Customers can be assured that they will receive consistently good lumber, shipment after shipment. All lumber is double end trimmed, and graded after kiln drying by NHLA trained lumber inspectors. Planing (S2S) facilities are available on site. Quality control is key. Our hands-on approach is seen throughout the entire operation. Sirianni Hardwoods believes in old-fashioned integrity, quality and service. To obtain additional information about the company , please contact us at info@siriannihardwoods.com.